Evaluating our self is a healthy way to gauge how you’re growing and what changes to make. Quickly this act of self-evaluation turns into self-devaluation. And before you know it you’re in full blown self-criticism mode. Self-criticism rears its ugly head by turning our scale of objective self-evaluation into self-destructive. If this sounds like you, there’s signs to show if you’re too self-critical. Self-criticism thoughts are linked to how we feel about ourselves, our self-worth, and how we measure up to the people around us. Perfectionism has been tied to being overly self-critical. It’s like constantly setting an expectation that’s nearly impossible to reach over and over again. Which leads to beating yourself up over and over again. 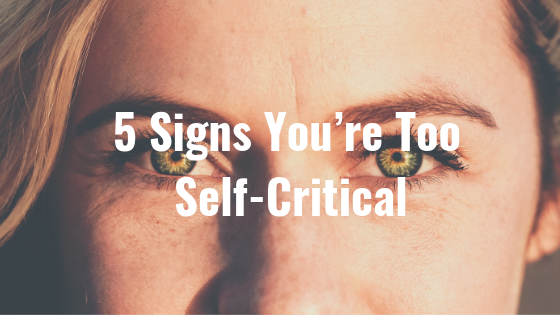 Here’s 5 Signs to help you identity if you’re letting self-criticism run the show…. 1. You quickly blame yourself for most situations. You constantly feel personally responsible for all the bad things that happen in your life and you’re the first one to blame yourself when things aren’t perfect. 2. You label yourself a failure when you mess up. Instead of saying “that wasn’t the best way to do that, I’ll try better next time…”, you attack your character instead of learning from your mistakes. 3. You avoid difficult situations. Any new or different situation feels like another chance for you to fail. You’d rather completely avoid a situation than address it head on. Everything you do, you compare to someone else. You never feel pretty enough, buff enough, thin enough, rich enough, etc. You’re trying to live up to impossibly high standards of living. 5. You’re a worry wart. You see most situations as a worst case scenario. You find yourself constantly feeling worried about all the things that could go wrong. It’s extremely difficult for you to find the small pleasures in your daily life. If you personally identify with two or more of these signs…. there’s a possibility you’re too self-critical. To stop self-criticism in it’s tracks we need to wake up and address it head on. Autopilot thoughts aren’t going to change unless you start paying attention and change the tape that keeps playing. Self-criticism is a form of self-sabotage. If you don’t actively address it you’re inactively choosing to sabotage yourself. Overcoming self-sabotaging behaviors requires expanding your self-awareness. Negativity should no longer be your default setting. You deserve more from yourself. I know you have what it takes to change this. I got your back on whatever you need to banish that self-critical voice. Aniesa Hanson is a licensed Tampa therapist and founder of Aniesa Hanson Counseling. Aniesa specializes in counseling Tampa women, men, and couples to live happier more fulfilled lives. To schedule your free 15 Minute Phone Consultation CLICK HERE or call (813)333-1425 to see how Aniesa can help you.